Raymond Crowe is called The Unusualist for a good reason – there is no other entertainer like him. Originally from Adelaide, Australia, Raymond has charmed audiences all over the world. His amazing signature hand shadow piece performed to the Louis Armstrong classic What a Wonderful World, was a global YouTube sensation that has now been seen by an estimated 20,000,000 people. In high demand overseas, some of Raymond’s amazing performances include the UK’s Royal Variety Performance in front of the Queen, Caesars Palace in Las Vegas for NBC’s The World’s Greatest Magic and The Late Show with David Letterman. In his own backyard, Raymond is a highly respected artiste who was a Grand Finalist on Australia’s Got Talent with other notable appearances including Spicks and Specks, The Footy Show and The Melbourne Comedy Extravaganza. In addition to regularly performing his own popular shows, Raymond is also highly sought-after entertainer for corporate events, functions and prestigious overseas shows such as The Illusionists 2.0. If you’re looking to hire a stand-out entertainer for your next corporate function, then look no further than Raymond Crowe. 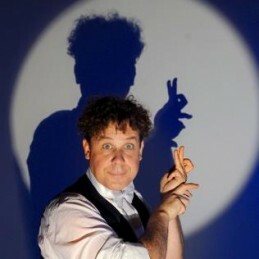 Illusionist, magician, hand shadow artist, ventriloquist, mime and comedian all rolled into one; Raymond has the special ability to captivate, engage, uplift and energise his audience, whether it’s an intimate affair or a large-scale event. Although his gift is amazing, it’s more than just a magic show. Raymond’s charming act is original, highly entertaining and extremely memorable, guaranteed to amaze and delight any audience.